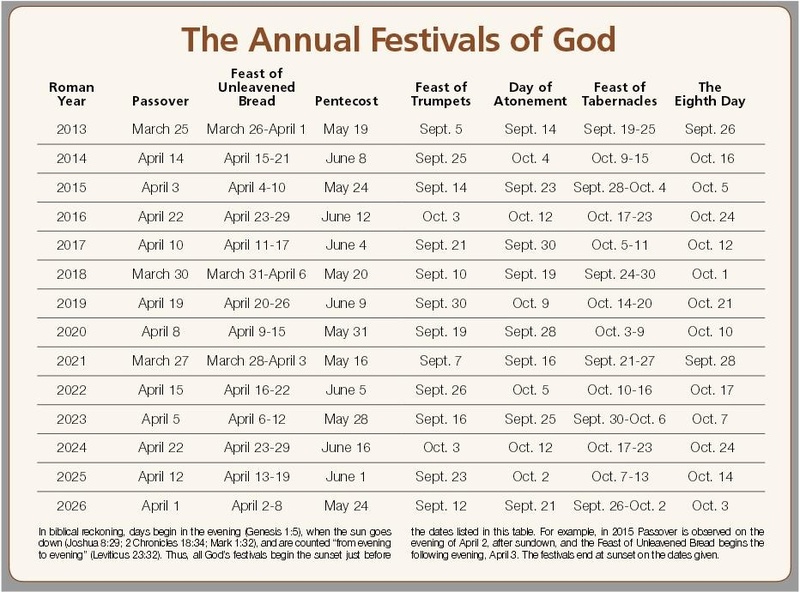 View the dates for God’s Holy Days — Passover, Feast of Unleavened Bread, Pentecost, Feast of Trumpets, Atonement, Feast of Tabernacles and the Eighth Day. In biblical reckoning, days begin in the evening (Genesis 1:5 Genesis 1:5And God called the light Day, and the darkness he called Night. And the evening and the morning were the first day. American King James Version×), when the sun goes down (Joshua 8:29 Joshua 8:29And the king of Ai he hanged on a tree until eventide: and as soon as the sun was down, Joshua commanded that they should take his carcass down from the tree, and cast it at the entering of the gate of the city, and raise thereon a great heap of stones, that remains to this day. American King James Version×; 2 Chronicles 18:34 2 Chronicles 18:34And the battle increased that day: however, the king of Israel stayed himself up in his chariot against the Syrians until the even: and about the time of the sun going down he died. American King James Version×; Mark 1:32 Mark 1:32And at even, when the sun did set, they brought to him all that were diseased, and them that were possessed with devils. American King James Version×), and are counted “from evening to evening” (Leviticus 23:32 Leviticus 23:32It shall be to you a sabbath of rest, and you shall afflict your souls: in the ninth day of the month at even, from even to even, shall you celebrate your sabbath. American King James Version×). Thus, all God’s festivals begin the sunset just before the dates listed in this table. For example, in 2019 Passover is observed on the evening of April 18, after sundown, and the Feast of Unleavened Bread begins the following evening, April 19. The festivals end at sunset on the dates given. American King James Version×). Passover, although not observed as a Holy Day, is the first festival of the year. The Feast of Unleavened Bread teaches us that we have been called to reject lawlessness and repent of sin. We are to live by every word of God and according to the teachings of Jesus Christ (1 Corinthians 5:8 1 Corinthians 5:8Therefore let us keep the feast, not with old leaven, neither with the leaven of malice and wickedness; but with the unleavened bread of sincerity and truth. American King James Version×; Matthew 4:4 Matthew 4:4But he answered and said, It is written, Man shall not live by bread alone, but by every word that proceeds out of the mouth of God. American King James Version×). During this festival, leaven symbolizes sin and, as such, is removed from our homes for the seven days of the festival (1 Corinthians 5:7-8 1 Corinthians 5:7-8 7 Purge out therefore the old leaven, that you may be a new lump, as you are unleavened. For even Christ our passover is sacrificed for us: 8 Therefore let us keep the feast, not with old leaven, neither with the leaven of malice and wickedness; but with the unleavened bread of sincerity and truth. American King James Version×; Exodus 12:19 Exodus 12:19Seven days shall there be no leaven found in your houses: for whoever eats that which is leavened, even that soul shall be cut off from the congregation of Israel, whether he be a stranger, or born in the land. American King James Version×). By eating unleavened bread we picture living a life of sincerity and truth, free from sin. The Feast of Pentecost , or firstfruits, teaches us that Jesus Christ came to build His Church. This festival pictures the coming of the Holy Spirit and the establishment of the Church. The firstfruits are those who will be given salvation at the return of Christ. They have been empowered with the Holy Spirit, which creates in each one a new heart and nature to live by the commandments of God (Exodus 23:16 Exodus 23:16And the feast of harvest, the first fruits of your labors, which you have sown in the field: and the feast of ingathering, which is in the end of the year, when you have gathered in your labors out of the field. American King James Version×; Acts 2:1-4 Acts 2:1-4 1 And when the day of Pentecost was fully come, they were all with one accord in one place. 2 And suddenly there came a sound from heaven as of a rushing mighty wind, and it filled all the house where they were sitting. 3 And there appeared to them cloven tongues like as of fire, and it sat on each of them. 4 And they were all filled with the Holy Ghost, and began to speak with other tongues, as the Spirit gave them utterance. American King James Version×, Acts 2:37-39 Acts 2:37-39 37 Now when they heard this, they were pricked in their heart, and said to Peter and to the rest of the apostles, Men and brothers, what shall we do? 38 Then Peter said to them, Repent, and be baptized every one of you in the name of Jesus Christ for the remission of sins, and you shall receive the gift of the Holy Ghost. 39 For the promise is to you, and to your children, and to all that are afar off, even as many as the LORD our God shall call. American King James Version×; Acts 5:32 Acts 5:32And we are his witnesses of these things; and so is also the Holy Ghost, whom God has given to them that obey him. The Day of Atonement teaches us that Jesus Christ gave His life to atone for the sins of all mankind. It also points to the time when Satan will be bound for 1,000 years (Leviticus 16:29-30 Leviticus 16:29-30 29 And this shall be a statute for ever to you: that in the seventh month, on the tenth day of the month, you shall afflict your souls, and do no work at all, whether it be one of your own country, or a stranger that sojournes among you: 30 For on that day shall the priest make an atonement for you, to cleanse you, that you may be clean from all your sins before the LORD. American King James Version×; Leviticus 16:20-22 Leviticus 16:20-22 20 And when he has made an end of reconciling the holy place, and the tabernacle of the congregation, and the altar, he shall bring the live goat: 21 And Aaron shall lay both his hands on the head of the live goat, and confess over him all the iniquities of the children of Israel, and all their transgressions in all their sins, putting them on the head of the goat, and shall send him away by the hand of a fit man into the wilderness: 22 And the goat shall bear on him all their iniquities to a land not inhabited: and he shall let go the goat in the wilderness. American King James Version×). This Holy Day pictures our High Priest, Jesus Christ, making atonement for our sins, which allows us to be reconciled to God and enter into the “holiest of all” (Hebrews 9:8-14 Hebrews 9:8-14 8 The Holy Ghost this signifying, that the way into the holiest of all was not yet made manifest, while as the first tabernacle was yet standing: 9 Which was a figure for the time then present, in which were offered both gifts and sacrifices, that could not make him that did the service perfect, as pertaining to the conscience; 10 Which stood only in meats and drinks, and divers washings, and carnal ordinances, imposed on them until the time of reformation. 11 But Christ being come an high priest of good things to come, by a greater and more perfect tabernacle, not made with hands, that is to say, not of this building; 12 Neither by the blood of goats and calves, but by his own blood he entered in once into the holy place, having obtained eternal redemption for us. 13 For if the blood of bulls and of goats, and the ashes of an heifer sprinkling the unclean, sanctifies to the purifying of the flesh: 14 How much more shall the blood of Christ, who through the eternal Spirit offered himself without spot to God, purge your conscience from dead works to serve the living God? American King James Version×). By fasting on this day, we draw closer to God and picture the reconciliation of mankind to God. Christ is essential in this process as our High Priest (Hebrews 4:14-15 Hebrews 4:14-15 14 Seeing then that we have a great high priest, that is passed into the heavens, Jesus the Son of God, let us hold fast our profession. 15 For we have not an high priest which cannot be touched with the feeling of our infirmities; but was in all points tempted like as we are, yet without sin. American King James Version×; Hebrews 5:4-5 Hebrews 5:4-5 4 And no man takes this honor to himself, but he that is called of God, as was Aaron. 5 So also Christ glorified not himself to be made an high priest; but he that said to him, You are my Son, to day have I begotten you. American King James Version×; Hebrews 5:10 Hebrews 5:10Called of God an high priest after the order of Melchisedec. American King James Version×) and as our eternal sacrifice for sin (Hebrews 9:26-28 Hebrews 9:26-28 26 For then must he often have suffered since the foundation of the world: but now once in the end of the world has he appeared to put away sin by the sacrifice of himself. 27 And as it is appointed to men once to die, but after this the judgment: 28 So Christ was once offered to bear the sins of many; and to them that look for him shall he appear the second time without sin to salvation. The Feast of Tabernacles teaches us that when Jesus Christ returns, a new society will be established with Christ as King of Kings and Lord of Lords. Christ, assisted by the resurrected saints, will set up His government on the earth for 1,000 years (Revelation 19:11-16 Revelation 19:11-16 11 And I saw heaven opened, and behold a white horse; and he that sat on him was called Faithful and True, and in righteousness he does judge and make war. 12 His eyes were as a flame of fire, and on his head were many crowns; and he had a name written, that no man knew, but he himself. 13 And he was clothed with a clothing dipped in blood: and his name is called The Word of God. 14 And the armies which were in heaven followed him on white horses, clothed in fine linen, white and clean. 15 And out of his mouth goes a sharp sword, that with it he should smite the nations: and he shall rule them with a rod of iron: and he treads the wine press of the fierceness and wrath of Almighty God. 16 And he has on his clothing and on his thigh a name written, KING OF KINGS, AND LORD OF LORDS. American King James Version×; Revelation 20:4; Leviticus 23:39-43 Leviticus 23:39-43 39 Also in the fifteenth day of the seventh month, when you have gathered in the fruit of the land, you shall keep a feast to the LORD seven days: on the first day shall be a sabbath, and on the eighth day shall be a sabbath. 40 And you shall take you on the first day the boughs of goodly trees, branches of palm trees, and the boughs of thick trees, and willows of the brook; and you shall rejoice before the LORD your God seven days. 41 And you shall keep it a feast to the LORD seven days in the year. It shall be a statute for ever in your generations: you shall celebrate it in the seventh month. 42 You shall dwell in booths seven days; all that are Israelites born shall dwell in booths: 43 That your generations may know that I made the children of Israel to dwell in booths, when I brought them out of the land of Egypt: I am the LORD your God. American King James Version×; Matthew 17:1-4 Matthew 17:1-4 1 And after six days Jesus takes Peter, James, and John his brother, and brings them up into an high mountain apart, 2 And was transfigured before them: and his face did shine as the sun, and his raiment was white as the light. 3 And, behold, there appeared to them Moses and Elias talking with him. 4 Then answered Peter, and said to Jesus, Lord, it is good for us to be here: if you will, let us make here three tabernacles; one for you, and one for Moses, and one for Elias. American King James Version×). Rule under His laws will spread from Jerusalem throughout the world to usher in an unprecedented period of peace and prosperity (Isaiah 2:2-4 Isaiah 2:2-4 2 And it shall come to pass in the last days, that the mountain of the LORD’s house shall be established in the top of the mountains, and shall be exalted above the hills; and all nations shall flow to it. 3 And many people shall go and say, Come you, and let us go up to the mountain of the LORD, to the house of the God of Jacob; and he will teach us of his ways, and we will walk in his paths: for out of Zion shall go forth the law, and the word of the LORD from Jerusalem. 4 And he shall judge among the nations, and shall rebuke many people: and they shall beat their swords into plowshares, and their spears into pruning hooks: nation shall not lift up sword against nation, neither shall they learn war any more. American King James Version×; Daniel 2:35 Daniel 2:35Then was the iron, the clay, the brass, the silver, and the gold, broken to pieces together, and became like the chaff of the summer threshing floors; and the wind carried them away, that no place was found for them: and the stone that smote the image became a great mountain, and filled the whole earth. American King James Version×; Daniel 2:44 Daniel 2:44And in the days of these kings shall the God of heaven set up a kingdom, which shall never be destroyed: and the kingdom shall not be left to other people, but it shall break in pieces and consume all these kingdoms, and it shall stand for ever. American King James Version×; Daniel 7:13-14). The Eighth Day teaches us that Jesus Christ will complete His harvest of humans by raising from the dead and extending salvation to all human beings who have died in the past and have never been given a full opportunity for salvation (Ezekiel 37:1-14 Ezekiel 37:1-14 1 The hand of the LORD was on me, and carried me out in the spirit of the LORD, and set me down in the middle of the valley which was full of bones, 2 And caused me to pass by them round about: and, behold, there were very many in the open valley; and, see, they were very dry. 3 And he said to me, Son of man, can these bones live? And I answered, O Lord GOD, you know. 4 Again he said to me, Prophesy on these bones, and say to them, O you dry bones, hear the word of the LORD. 5 Thus said the Lord GOD to these bones; Behold, I will cause breath to enter into you, and you shall live: 6 And I will lay sinews on you, and will bring up flesh on you, and cover you with skin, and put breath in you, and you shall live; and you shall know that I am the LORD. 7 So I prophesied as I was commanded: and as I prophesied, there was a noise, and behold a shaking, and the bones came together, bone to his bone. 8 And when I beheld, see, the sinews and the flesh came up on them, and the skin covered them above: but there was no breath in them. 9 Then said he to me, Prophesy to the wind, prophesy, son of man, and say to the wind, Thus said the Lord GOD; Come from the four winds, O breath, and breathe on these slain, that they may live. 10 So I prophesied as he commanded me, and the breath came into them, and they lived, and stood up on their feet, an exceeding great army. 11 Then he said to me, Son of man, these bones are the whole house of Israel: behold, they say, Our bones are dried, and our hope is lost: we are cut off for our parts. 12 Therefore prophesy and say to them, Thus said the Lord GOD; Behold, O my people, I will open your graves, and cause you to come up out of your graves, and bring you into the land of Israel. 13 And you shall know that I am the LORD, when I have opened your graves, O my people, and brought you up out of your graves, 14 And shall put my spirit in you, and you shall live, and I shall place you in your own land: then shall you know that I the LORD have spoken it, and performed it, said the LORD. American King James Version×; Romans 11:25-27 Romans 11:25-27 25 For I would not, brothers, that you should be ignorant of this mystery, lest you should be wise in your own conceits; that blindness in part is happened to Israel, until the fullness of the Gentiles be come in. 26 And so all Israel shall be saved: as it is written, There shall come out of Sion the Deliverer, and shall turn away ungodliness from Jacob: 27 For this is my covenant to them, when I shall take away their sins. American King James Version×; Luke 11:31-32 Luke 11:31-32 31 The queen of the south shall rise up in the judgment with the men of this generation, and condemn them: for she came from the utmost parts of the earth to hear the wisdom of Solomon; and, behold, a greater than Solomon is here. 32 The men of Nineve shall rise up in the judgment with this generation, and shall condemn it: for they repented at the preaching of Jonas; and, behold, a greater than Jonas is here. American King James Version×; Revelation 20:11-13 Revelation 20:11-13 11 And I saw a great white throne, and him that sat on it, from whose face the earth and the heaven fled away; and there was found no place for them. 12 And I saw the dead, small and great, stand before God; and the books were opened: and another book was opened, which is the book of life: and the dead were judged out of those things which were written in the books, according to their works. 13 And the sea gave up the dead which were in it; and death and hell delivered up the dead which were in them: and they were judged every man according to their works. The annual cycle of the celebration of the festivals and Holy Days reminds Christ’s disciples that He is working out His plan of extending salvation from sin and death and offering the gift of eternal life in the family of God to all humanity—past, present and future.